“Theatre” is clearly a conventional term, as this is a stepped area forming part of an open-air sanctuary in the agora of Kamiros. From the steps, the faithful could watch the ceremonies and sacrifices carried out onan altar/sacrificial hearth in front of the steps. According to another interpretation, the area, though sacred, was used as a meeting-place of the local councils and city authorities. This function is consistent with the inscribed list of names of thedamiurges, the eponymous archons of Kamiros, who were also priests of Hestia andZeus Teleios. The inscription, on the lateral sides of the fountain colonnade, is dated to the latter half of the 1st c. BC. The sanctuary consists of two squares, a smaller one on the south with a central rectangular altar or votive offering base, and a second, larger one on the north. On the east side of the second square lie the three steps, arranged in an open U-shape. Very close to them is preserved an altar or sacrificial hearth of upright slabs. The two squares are divided by a free-standing colonnade. This is the remnant of an older, Late Classical fountain, which was abolished when the sanctuary was built in the early Hellenistic period. The sanctuary remained in use into Roman times. At some later phase, during the Hellenistic period, the originally open face of the square with the steps was closed off by a wall adorned with half-columns and with three doorways in its centre. 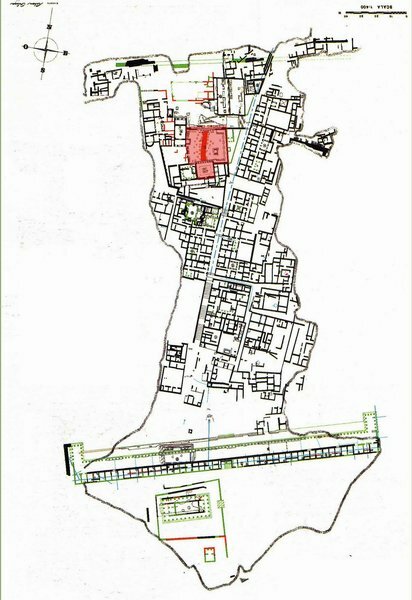 In the Roman period, a paved road ran through the centre of the square, along which votive offering bases were discovered during the Italian excavation The sanctuary, along with the rest of the Kamiros archaeological site, was excavated and reconstructed by the Italian Archaeological Institute of Rhodes in 1928-1944,during the period of Italian rule. “Theatre” at the “sanctuary of the Fountain Square” in the agora of Kamiros. “Theatre” is clearly a conventional term, as this is a stepped area forming part of an open-air sanctuary. From the steps, the faithful could watch the ceremonies and sacrifices carried out on an altar/sacrificial hearth in front of the steps. According to another interpretation, the area, though sacred, was used as a meeting-place of the local councils and city authorities. Documentation is held in the archives of the 22nd Ephorate of Prehistoric and Classical Antiquities and the Italian School of Archaeology at Athens. 1. G. Jacopi, Esplorazione archeologica di Camiro II, Clara Rhodos VI-VII, 1932,223 ff. 2. Γρ. Κωνσταντινόπουλος, Φιλέρημος, Ιαλυσός – Κάμιρος, Οδηγός Εκδόσεων Απόλλων, pp. 40-63. 3. Γρ. Κωνσταντινόπουλος, Αρχαία Ρόδος, Αθήνα 1986, 168-178. 4. H. Lauter, Struktur statt Typus. Zu einem hellenistischen Architekturmotiv, AA 1982, 703-724. 5. L. M. Caliò, Lo ΙΕΡΟΘΥΤΕΙΟΝ e la funzione della stoa di Camiro, Parola del Passato LIX, 2004, pp. 451-452. 6. A. Di Vita, La topografia della città, in Livadiotti –Rocco, op. cit., pp. 66-70. 7. D. Heilmeyer, ΘΕΟΙΣ ΠΑΣΙ – Pergamon und Rom, in Ρόδος 2400 χρόνια. Η πόλη της Ρόδου από την ίδρυσή της μέχρι την κατάληψη από τους Τούρκους (1523). Διεθνές Επιστημονικό Συνέδριο, Ρόδος, 24-29 Οκτωβρίου 1993, Vol. II, Αθήνα 2000, pp. 83-88. Ancient Kamiros, Municipality of Rhodes, Prefecture of the Dodecanese. The steps, conventionally termed a theatre, forms part of an open-air sanctuary in theagora of Kamiros, consisting of two squares, a smaller one on the south with a centralrectangular altar or votive offering base, and a second, larger one on the north. On the east side of the second square lie the three steps, arranged in an open U-shape. Very close to them is preserved an altar or sacrificial hearth of upright slabs. The two squares are divided by a free-standing colonnade of Doric pilasters and piers at its ends; this is the remnant of an older, Late Classical fountain, which was abolished when the sanctuary was built in the early Hellenistic period. The colonnade was retained as a dividing line between the two squares. 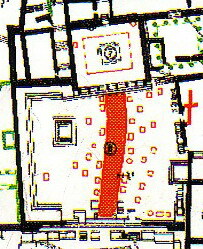 According to D. Heilmeyer, the maller square, behind the colonnade, was the most important area of the sanctuary.The faithful, sitting on the steps of the second square, could observe through the half-columns the ceremonial rites carried out behind the dividing colonnade and on the altar in front of the steps. He also believes that the sanctuary was dedicated to all the Greek gods, as indicated by its architecture and, above all, the inscription θεοῖς πᾶσι (“to all the gods”) on the bases of the many votive offerings. More recently, the Italian researcher of Kamiros L. Caliò has opined that the area,though sacred, was used as a meeting-place of the local councils and city authorities.This function is consistent with the inscribed list of names of the damiurges, the eponymous archons of Kamiros, who were also priests of Hestia and Zeus Teleios. The inscription, on the lateral sides of the fountain colonnade, is dated to the latter half of the 1st c. BC.The sanctuary remained in use into Roman times. At some later phase, during the Hellenistic period, the originally open face of the square with the steps was closed off by a wall adorned with half-columns and with three doorways in its centre. In the Roman period, a paved road ran through the centre of the square, along which votive offering bases were discovered during the Italian excavation. The road is no longer visible, as it was filled in during the Italian reconstruction. That is also when the inscribed votive offering bases must have been placed in the square and on the steps. Relatively good state of preservation. The sanctuary, along with the rest of the Kamiros archaeological site, was excavated and reconstructed by the Italian Archaeological Institute of Rhodes in 1928-1944, during the period of Italian rule. Located in an archaeological site open to the public. There is no public access to the south square of the sanctuary, in order to protect the antiquities. Ministry of Culture /22nd Ephorate of Prehistoric and Classical Antiquities.